A book overflowing with scrumptious chocolate and marvelous characters with an ingenious twist at the end, this book has everything! 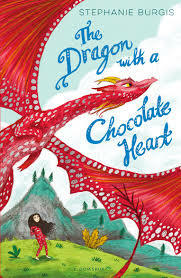 The Dragon With A Chocolate Heart is an incredible book about an adventurous young dragon called Aventurine who decides to journey out of the safety of her cave to prove herself to her family. Disaster soon strikes when a dragon’s most dangerous prey, a human uses an enchanted hot chocolate to transform her into a human girl. Now Aventurine must survive in unfamiliar territory, a human village. The things that really brought this book together were the indescribably well-developed characters and the vivid descriptions of heavenly chocolate. Another wonderful aspect of the book was how the world of humans is viewed through a dragons eyes, which gave me a whole new outlook on life and also allowed for amusing descriptions such as hair being called ‘head fur’. The best part of the book though, is the carefully planned and awesome twist at the end of the novel, made even better by the subtle hints throughout the story. I have absolutely no criticism for this book, and I thought it was an absolute delight to read!